LED lighting promises to provide energy savings that can be applied to all forms of lighting from residential to industrial and commercial manufacturing and business. Widely regarded as a lighting technology still in its infancy as recently as 5 years ago, LED lighting has quickly progressed to being at the forefront of energy efficient lighting alternatives. There are some differences that must be taken into when contemplating a change to LED lighting however, which means measuring their effectiveness and efficiency against standard forms of lighting can require a different approach from what is normally accepted. LEDs and traditional forms of lighting such as HID and incandescent produce light in wholly different ways which affects the manner in which light is radiated from their surfaces. With incandescent bulbs and HID lighting such as metal halides, light is radiated outwards 360 degrees over the bulbs surface. As a result, we normally measure the output of these lamps as a total sum output which only tells us how much light is produces and nothing more. LEDs on the other hand do not radiate light over their entire surface, but rather only over a limited range, usually anywhere from 20 to 180 degrees. Rather than radiate light in all directions from their surface, their output is limited to a smaller area. The reasons for this basically come down to fundamental differences in the designs of these respective light sources. For most types of glass bulbs, be they incandescent or HID, light is created within the glass bulb and radiated outwards in all directions. With LEDS however, there is no glass bulb, and light is radiated only from the surface of a flat piece of semi-conducting material. In effect, light is only radiated outwards from a single flat surface. The problems this creates are related to perceived brightness, lamp intensity, and how well light is distributed. For most forms of traditional lighting, since the light is radiated in all directions, we usually need to include reflectors, lenses and diffusers in order to direct as much of the light as possible towards where it is needed. The result of this is called delivered light, and it is a more effective measure of how well a lamp performs than simply taking into account total lumen production. For instance, if we take a simple 100 watt incandescent bulb producing 1500 lumens and put it into a simple bare socket, it will radiate its 1500 lumens in all directions. Now, if we need to illuminate an area such as an open floor area or workspace, a lot of the light produced is going to go somewhere besides where it is needed. For most practical intents, even if we include a reflector that catches and refocuses the light towards where we want it, we still lose as much as 40-50% of that 100 watt bulbs’ lumen output. What this means for efficiency and comparison between light sources is many-fold. We can for example look at a metal halide bulb and observe that it has a luminous efficacy of 100 lumens per watt. Compared to an incandescent at 15 lumens per watt, this would appear to be quite efficient indeed. However, if we also factor in the losses from poor directional properties and losses due to absorption and diffusion in accompanying reflective assemblies, we see that we are losing much of the light produced as much is not reaching our intended target areas. Despite having a high luminous efficacy, up to half the metal halide’s luminous output is not being delivered. As a result, if we are to get a more accurate idea of a lamps USEABLE output, we are better served considering delivered output rather than total lamp output. When we consider delivered output, we find some interesting results when we consider LEDs against traditional light sources. As we mentioned earlier, LEDs do not radiate light over 360 degrees, but rather concentrate all of their output over an area of half that range or less. If we take out same hypothetical work space and hang a bare LED light source a 180 degree radiation pattern over it, rather than losing a lot of light in unintended directions, almost all of the light is focused over the breadth of our workspace. If we also included a reflective housing with our LED, even more light is focused, and losses are far lower than would be with an incandescent or metal halide. Now, if we simply consider that a typical LED worklight fixture is managing an efficacy of only 70 lumens per watt, it would initially seem less efficient than the metal halide with its 100 lumens per watt. But, when we realize that almost half the metal halides' light is not reaching our target area, while almost all of the light produced by the LED is, we then see that in practical application, the LED is in fact more efficient. Granted, this is a very basic breakdown of the differences in how LEDs and traditional light sources distribute light, and there are other factors that must be realized. For instance, for very large areas, the smaller radiation pattern of LEDs can present something of a problem in large scale, high bay, and overhead lighting applications. However, the design of LEDs is such that multiple LEDs can easily be arranged in configurations designed to create a wider or smaller light spread as needed for a given application. As it stands, in order to get the total delivered output needed from LEDs it is necessary to arranged them in multiple sets to form a single light source. So manufacturers have found it is simply a matter of arranging each LED in a specific pattern to achieved the desired directional output. Additionally, manufacturers are able to modify to a large extent the degree of radiation from a single LED, to produce LEDs with radiation patterns anywhere from 20 to 180 degrees. 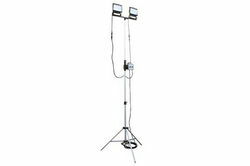 The end result is an LED light source that can be tailored to cover as large or small an area as needed without the need for reflectors. Clearly, the ability to efficiently deliver light output gives LEDs a distinct advantage over traditional light sources. The tighter radiation pattern of LEDs provides further benefits in the form of reduced need for additional hardware such as reflectors and diffusers, which reduces losses as well as reduces overall costs for fixture accessories. When considering a switch to LEDs, the old standards of total lumen output can no longer be relied upon as an effective measure of lamp performance. Even for traditional light sources, considering delivered output provides a more effective means of evaluation and a more accurate measure of actual lamp performance. By comparing light sources in this way, we can then maximize their efficiency potential and further improve lighting effectiveness, which in the end means less money spent on powering our lights and a brighter workplace.